In today’s post, I will discuss the ethics application and approval process for Fury. According to Fury, on August 28, 2012, Michael Marriott (of Watching the Deniers) and John Cook (of SKS) began a program of monitoring and “real time” categorization of “conspiracist ideation” within blog articles and comments. The monitoring program continued until October 18, 2012. The program was carried out under UWA ethics approval RA/4/1/4007 “Understanding Statistical Trends”, an approval originally issued for a protocol for questioning pedestrians on their understanding of statistical trends. In August 2010, Lewandowsky had applied for an amendment under which he almost completely changed the scope of the project, which now consisted of an online questionnaire on conspiracy theory, attitudes towards free markets etc. Attached to the amendment application were the new protocols. 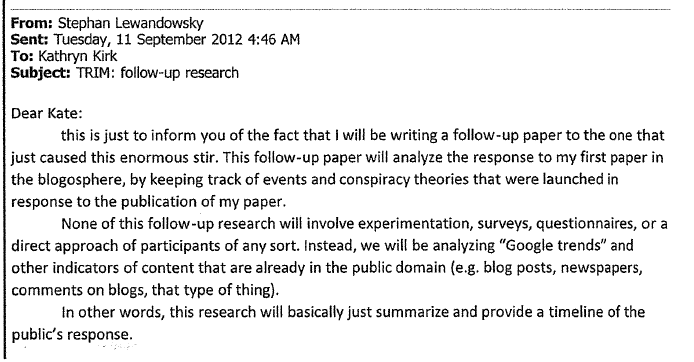 Lewandowsky advised the ethics officer that he wanted to obtain responses from skeptic blogs, but the survey was actually distributed through stridently anti-skeptic blogs. In the course of this amendment, Lewandowsky applied for permission to deceive bloggers about his association with the survey. As a result, survey invitations to skeptic blogs were distributed by a Charles Hanich without mentioning the names of Lewandowsky or any of the actual coauthors. Lewandowsky’s follow-up article (“Fury”) once again completely changed the nature and scope of the research. Instead of administering an online questionnaire, Fury purported to carry out textual analysis of online blog articles and blog comments for conspiracy theory. And whereas the existing approval presumed anonymization, Fury purported to identify “psychopathological characteristics” (in the later words of the journal) in named individuals (Lewandowsky’s critics). In order to do so, Lewandowsky and coauthors culled and trimmed quotations from blog threads during the period. These trimmed quotations were then grouped into synthesized “conspiracy theories”, though the use of the term “conspiracy theory” in Fury became very elastic, no longer limited to untrue fantasies involving governments and major institutions but morphed to include even the most minor methodological criticism, even if the criticism was valid. In the predecessor questionnaires, Lewandowsky had provided the ethics committee with questionnaires (“scales”) that had been, at least to some extent, previously used in the literature. However, in Fury, Lewandowsky introduced his own novel scale for attributing conspiracist ideation to blog comments: while some of the criteria were drawn from prior literature, their use as criteria was novel. One of the major themes of Fury arose from Lewandowsky’s earlier concealment from skeptic blogs of his association with the survey. Although Australian human research policy required Lewandowsky to unwind the earlier deception, he did not do so. Thus when bloggers searched their 2010 emails for an invitation from “Lewandowsky”, their searches came up empty, leading to considerable puzzlement among the skeptic blogs as to who Lewandowsky had contacted. Rather than simply clearing up the problem by notifying the bloggers in question of his connection with the Hanich email, Lewandowsky sought to embarrass the bloggers as much as he could, privately relishing the prospect of bloggers having “egg on their face”. In addition, rather than passively observing blog reaction, Lewandowsky busily intervened with his own blog articles, in which he disparaged and taunted individuals that would be later telediagnosed (including and, in particular, me). Between September 3 and September 11, Lewandowsky published multiple blog posts at the UWA blog Shaping Tomorrow’s World (here, here, here, here, here) and desmog here, as well as posts by coauthor Marriott here. I had not initially covered Lewandowsky at Climate Audit and did not do so until after I had been personally named or identified in multiple Lewandowsky’s blog posts. This quick synopsis barely touches the backstory. 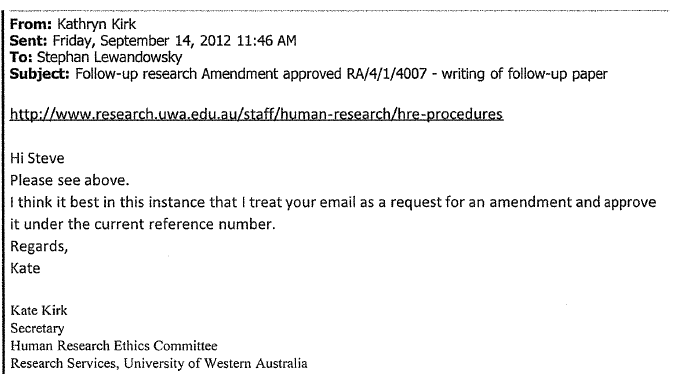 Research psychologists are obligated to comply with the human research ethics policies of their universities, which, in Lewandowsky’s case, required him to comply with both University policies and the Australian National Statement. Policies within the latter document categorically prohibit identifiability of subjects of psychological research. In the aftermath of the rejection of Fury, Lewandowsky has chafed at the journal taking this policy seriously, but the policy is very clear and Lewandowsky’s dispute is necessarily with the policy and not the journal’s enforcement of the policy. In addition, the National Statement regulates deception and active concealment in psychological research. It is permitted in some limited circumstances provided that approval has been obtained from an Ethics Committee (and not merely an ethics officer) and provided that measures are prescribed for unwinding the deception subsequent to the protocol. The Statement also contains extensive language enjoining the importance of respect for the subjects of the study. Both the Statement and policies of the University emphasize that protocols cannot begin until ethical approval is obtained, observing that starting without such approval may be misconduct. Three days later (Sept 14, 2012), Kirk responded to Lewandowsky, informing him that his request to proceed without ethics approval was not accepted, but that she would treat his letter as an amendment application under the existing protocol (RA/4/1/4007). 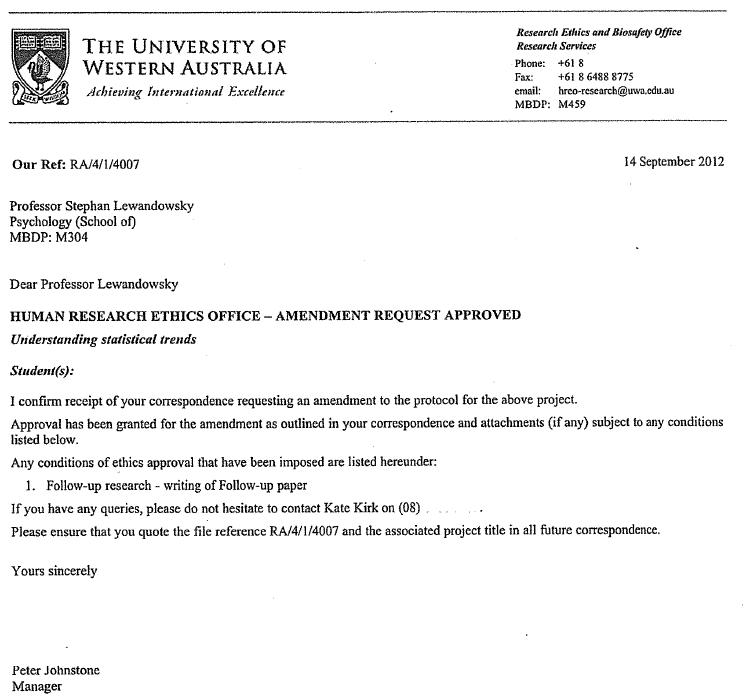 University policies for amending ethics approvals require the submission of an Amendment Application Form. This form contains salient questions that would have required Lewandowsky to be somewhat more forthcoming about the wholesale changes in the protocol that had already been implemented. Questions about the ethics application for Fury were raised in complaints to both the University and the journal in April 2013. The University peremptorily dismissed these concerns a couple of weeks later. The journal appointed its own investigation, which apparently reported in or about June 2013. According to the retraction statement negotiated by the journal with Lewandowsky, the journal investigation likewise did not “identify” any ethical issues in regard to Fury. However, after being publicly attacked by Lewandowsky’s associates and supporters, the journal subsequently stated that there were indeed ethics issues in respect to Fury, prompting further attacks by Lewandowsky and supporters. Stepping back somewhat from the immediate controversy, given the timing and limited scope of the ethics application shown above, it seems hard to understand how an investigation could have failed to identify “any” ethical issues. Release of the investigation reports from both the University and the journal would go a long way to answer such questions. This entry was written by Stephen McIntyre, posted on Apr 7, 2014 at 3:28 PM, filed under Uncategorized and tagged ethics, lewandowsky. Bookmark the permalink. Follow any comments here with the RSS feed for this post. Both comments and trackbacks are currently closed. None of this research will involve experimentation, surveys, questionaires, or a direct approach of participants of any sort. (My bold) That seems not to be the case, in this instance. Well I won’t give it away – ref – direct approach… but it is definitely the case! I meant that direct approach of the “participants” seems to have been unequivocally established, so the sentence in the ethics request is not supported by any evidence. I think the original wording is correct, the point being that an ethics approval *was* required, in contraduction of Lewandowsky’s assumption. Lew requested no ethics approval at all for the 2nd paper; he was told it was needed though an amendment to the original would suffice. Steve then tells us the amendment process they followed was not in accordance with guidelines. The “not” is correct. The claim of “no human participation” is completely false. The UWA rules explain clearly that ‘participant’ includes any individual identified in a record or in a databank. I am still very confused as to why anyone could think Lew’s stuff is research and why any university would want to associate itself with, or defend, this obvious tripe. That said, the approval process for the ‘research’ seems to be in flagrant contravention of the required procedures. One thing is for sure, the ‘Rule of Holes’ will apply here, as Lew can be relied on – using ever more flowery words – to keep digging himself deeper into the poo. Very very true but if they weren’t called out on it, how long before the mass media is reporting that 97% of all scientist AGREE!!!!!! that climate skeptics are psychopaths………..NO REALLY!!!!…. A peer reviewed paper says so, so it must be true!!!! I have to agree. Though thorough as always, I find Steve’s posts on Lewandowsky especially depressing. If Lewandowsky’s muck is credited as proper “research” in the peer reviewed journals, just what does that say about the current state of scholarship? I’m not sure it’s obvious tripe. I could imagine c*nspiracy theorists attracted to one side or the other of the climate debate. Rosie O’Donnell, for instance, is a big CAGW type, but also believes 9/11 was an inside job. And whereas the existing approval presumed anonymization, Fury purported to identify “psychopathological characteristics” (in the later words of the journal) in named individuals (Lewandowsky’s critics). In order to do so, Lewandowsky and coauthors culled and trimmed quotations from blog threads during the period. These trimmed quotations were then grouped into synthesized “conspiracy theories”, though the use of the term “conspiracy theory” in Fury became very elastic, no longer limited to untrue fantasies involving governments and major institutions but morphed to include even the most minor methodological criticism, even if the criticism was valid. One psychological puzzle is how the writer managed to write that and sound so calm. But is a new field opening up here called climopathology, where some other discipline seeks to help beleaguered climate scientists and swiftly degenerates into a heartless parody of its former self? Funded by Wolfson, courtesy of Royal Society. A wonderfully clear and calm summary of the inadequacy of the ethical approval process for Fury, following Hoax, but easily managing to exceed it in the mismatch between extent of ‘innovation’ and perfunctory lack of consideration. You may have been a key target but these points count for all of us. I hope the university and Frontiers publish the results of their investigations in short order. Definitely the UWA is not going the supply the rope with which to hang them. The Truth about Lewandowsky is not in their “best” interests. Some higher authority must force them. With the journal there is some chance because they seem to have some ethics left, although it took them ages to come to their latest statement. To be fair, I think most journals assume that the contributors would want to write good sound papers under the proper controls and tend to be taken on the back foot when poorly written agit-prop cobblers is stealthed in under the guise of proper research. They find it hard to understand why someone would drop a rattlesnake in the lucky-dip. The Seralini GMO study comes to mind here. Stuff like this does get published in supposedly good journals. I think a key component is that the work is affirming of existing biases within the peer reviewers and editors, which ties in with the ability in many journals for authors to be able to suggest editors and reviewers for their work. In the Seralini case, “The Message” was that GMO is bad. In Lew’s case, that AGW sceptics are mentally deficient. In both cases, the large flaws in the work were overlooked for the “truisms” they contained. I viewed “Recursive Fury” in a cache expecting to find perhaps some evidence for an assessment of the authors’ own sufferance of “recursive fury.” Plenty of fury, and almost totally nuts. It is more than an update of the previous paper, but in no insignificant part an analysis of the reaction to the first paper (“LOG12”) in various anonymous short internet posts. Once I hit the authors’ complaints about complaints about internet slowdowns made by a few anonymous people at this site, I had to stop reading, the authors’ mental meltdown to much to bear. I wonder if an independent and objective psychologist might consider taking a look at all this and end up writing a paper examining all the conspiratorial ideations Lewandowsky is so fond of, which are so plainly evident in the minds, conduct and compositions of Lewandowsky and his “team” and concluding that most, if not all, of those ideations widely exist in the cohort, including Mann, that Lewandowsky, Cook, Marriott and many others inhabit. Perhaps Frontiers would be interested in publishing it. I don’t know about a paper, there’s enough material for a conference at least! I wonder how many are aware of the very apposite comparison you make between the good Professor Lewandowsky and the raving lunatic that is Basil Fawlty. For me the aftermath of the whole debacle and the denial of obvious facts by Lew and the crew reminds more the Monty Python”s black knight scene – look, your arm’s cut off! No it isn”t! Richard, thank you for posting the clip. I didn’t have enough time to find it! I mentioned conspiracy ideation once, but I think I got away with it. If that is indeed the UWA Blog, and if indeed Lewandowsky has “fled the coup” to greener pastures in England, why is he still blogging there? Presumably they can have any guest author they like, but I know that Lewandowsky stated recently that he has been allowed to maintain a formal affiliation with UWA to transition his ongoing research projects more smoothly from UWA to Bristol. Thanks Skiphil. It just seemed strange. However, your explanation explains a lot. If he is maintaining a relationship with them, that would be cause for them to continue to cover for his mistakes. STW is essentially Lewandowsky’s personal blog. Pressure from concerned alumni forced him and STW “editorial board” to remove the UWA logo from its homepage late last year and withdraw claim of affiliation. logo on a website Shaping Tomorrow’s World. Ah! Thank you Alice. That makes sense. I wonder if they forced him to move the blog to a non-UWA server? The clearly laid out and detailed trail of malfeasance leaves no room for doubting the ill-will that the Lew group harbour toward any person who questions the manufactured and entirely spurious ‘consensus’ about climate science or their quite nasty operational procedures and unethical stance. Very little surprises me, but the unreasoning bile on display from this group of ‘scientists’ certainly does! I’ve made a few sight edits, mainly including references to the University’s Amendment Application Form, which Kirk, for some reason, did not require from Lewandowsky. That’s a nice five years worth of an ethical free pass ticket without much apparent further oversight after the initial detailed application for the “Understanding Statistical Trends” study. Under the system that’s in force in the United States, an Institutional Review Board approves a study for one year, after which the researcher can request a renewal. Five years? And you get to change the study completely, more than once, without having to file a new application? In the re-written RF which Frontiers declined to publish cotemporaneously with the retraction, Lew includes two technicaly required steps for a content analysis which were absent in the retracted version, both required the use of naive subjects. I wonder whether he applied for an amendment to his ethical approval in relatio to the rewrite. o/t , anyway breaking news: CA is one of the 3 central sceptical blogs: http://www.sciencedirect.com/science/article/pii/S0959378014000405 !! That’s quite a shift in emphasis – from a non-judgemental suggestion that blogs are filling a void in the existing knowledge testing process to a much more conventional (and judgemental) suggestion that blogs are part of a wider orchestration to ‘delegitimse and contest’ the expert knowledge base. I wonder who the reviewers were??? That is an interesting catch. I just read the working paper version. As you say it is very circumspect in its assessment of the high profile sites – though her assessment is largely non-substantive. I also think that she misses the dynamics of these sites which makes them potent in the field. Perhaps you can ask Amelia what led to the changes to her abstract. My guess is that Bob Ward helped with the reviewing/editing. Thanks for the link. Not an impressive paper. The authors do not seem particularly familiar with the subject area. For example, the working paper describes CA as “USA-authored”. One hopes this was fixed in the final published version, but that type of basic factual error even in a working draft speaks poorly to the authors’ knowledge of skeptic blogs. (or perhaps Steve joined Mark Steyn and moved to the US and I didn’t notice). I cant access “ttp://www.lse.ac.uk/GranthamInstitute/publications/WorkingPapers/Papers/120-29/Mapping-the-climate-sceptical-blogosphere.pdf” for some reason. but another buzz phrase to add to the collection. Slowly,slowly catchy monkey – but it must be a hard grind Steve, thanks for your perseverance. What was Lewandowsky’s reaction to the people who ignored his taunts and gibes? Without exhaustive trawling of climate blogs, large and small, it would be hard to know if a person had met the condition you stipulate. But Lewandowsky et al clearly reserved the right to attribute the words of someone completely different to a named person, like Richard Drake, then diagnose me with this or that psychological affliction. Not wishing to make it personal or anything. You do seem to be obsessed by it Richard. But without knowing if you were breast-fed, if you have amalgam fillings, and finding out what this here ink blot reminds you of, I can’t make an *exact* diagnosis – we aren’t all as well qualified as Prof. L.
🙂 Heck no, not obsessed. Amused certainly. Plus I consider myself a helpful datapoint for the more casual reader. Is there anyone else mentioned by name in the Fury SI where none of the words attributed to them were written by them? I don’t recall what ‘psychopathological characteristics’ were then said to apply to me by the great man and this accurately reflects how little I care about what Dr Lew thinks of anyone he wrote about. But the lack of ethics and proper care taken throughout this abysmal exercise I do care about, as I do about the apparent endorsement of the UK’s premier scientific academy for this garbage. You were in his head, Richard. So many of your posts had raised his hackles that he was seeing your name everywhere. Steve, in their dossier on you in one of the links, they left out the most critical item: enjoys playing squash every Tuesday at the club. o/t I see that Lew has a new paper on the uncertainty principle. There are some amusing comments at Jo Nova on the uncertainty of uncertainty. seems hard to understand how an investigation could have failed to identify “any” ethical issues. But easy if there never was an investigation and it only got through thanks to a bullying academic and too willing to help ethics officer. You would think that given the University was still dealing with complaints about the hideous Moon-landing Paper by Lewandowsky, they would have been a lot more circumspect about being so cavalier in further ethics approvals. It hardly appears there was a comprehensive process in place as claimed by Professor Owens. How can a totally different type of research and subject be claimed to be simply an amendment of an existing ethics approval when the research has been done and the paper written and published for that ethics approval they claimed to be amending? It can’t and should not have , ethics officer do not have much power nor a great job , often its ‘another ‘ job they do with their main one. And quite often ‘star academics’ can bully them with little senior management support being offered. Medicine with its high cost of ‘if it goes wrong’ has the best but not perfect ethics most other areas rely on ‘what is the worse that can happen’ to get them through . Everyone gets off, the BSing VP keeps face and Lew gets to claim his been found innocent. Annoying as hell but almost certainly how things will go. if there is any truth to Robyn Owens statement that the “University has completed its internal review of the academic process followed and finds that the complaint made against Professor Lewandowsky is not justified” then this “internal review” should have left a paper trail that could be followed up by legal means. KNR’s comment notwithstanding, I don’t believe that the Deputy Vice-Chancellor (Research) still feels very comfortable about this assertion. […]in Fury, Lewandowsky introduced his own novel scale for attributing conspiracist ideation to blog comments: while some of the criteria were drawn from prior literature, their use as criteria was novel. One of the major themes of Fury arose from Lewandowsky’s earlier concealment from skeptic blogs of his association with the survey. Although Australian human research policy required Lewandowsky to unwind the earlier deception, he did not do so. Knowing the “rules” wrt the obligation to disclose his deceptions, even if he truly believed his own myths and creative writing exercises, and even if he failed to comprehend the seriousness of his ethical lapses, the mind still boggles (or at least mine does!). How on earth did he ever climb as high as he did on the academic ladder?! Consider the juxtaposition of the songs and dances of “privacy/ethics concerns” Lew performed in order to avoid (delay?!) disclosure of the names of the skeptic blogs he falsely claimed to have contacted (while knowing he had not) with his apparent obliviousness to the consequences of his failure to protect the privacy of his Fury “subjects”. That so many who could and should have noticed this failed to do so during the peer review and/or “investigation” processes strongly suggests that the standards of all concerned are exceedingly low (if not non-existent). As a curious aside, btw, last night I was perusing the dog’s breakfast that he and his little helpers call “raw data” [40138_Lewandowsky_DataSheet1.PDF], which if I’m not mistaken were part of the now disappeared SI. Using the Document–>Examine Document feature, I opted to View “Hidden Text”. There is quite a lot in there [4.5 pages of 11pt Arial when I pasted into a Word doc], but it is not easily rendered into a format one can readily examine, i.e. it comes through as a single paragraph wall of text with some characters and many instances of word-spacing missing. Much appears to be duplicating that which is visible in the .pdf. But on checking to see if my own involuntary “contribution” was included in the hidden text, I noticed that there was no sign of it! Others (particularly those who know that their own involuntary “contributions” were mangled and/or otherwise truncated, might want to perform a similar check. Are there any pending FOIs that relate to those communications? … I thought you must be joking, DGH. We all know that Lew has quite the penchant for, well, to be kind, imagining that something he might have seen at one table had conveniently (if not miraculously) appeared at another. Consequently, I would much prefer to see some independent confirmation from Frontiers before I would give such a “request” any credence whatsoever! P.S. Steve, assuming this gets through, I have an earlier comment https://climateaudit.org/2014/04/07/the-ethics-application-for-lewandowskys-fury/#comment-537894 [posted at 4:08 PM] that seems to be stuck in moderation. I don’t think I broke any blog rules, so perhaps you could fish it out. Thanks. It is very difficult to believe that Frontiers would have asked Lew to “destroy all correspondence” in the way that he describes. If I were framing odds, it would be at least 33/1. Why would they do that? We know from Climategate that Mann asked people to delete emails, but it is hard to see any parallel here. I hope that this point is clarified by Frontiers, whose reputation has been put on the line by this allegation. Apologies to readers, and thanks, Sven. You are right. I wonder if some similarly creative explanation will be forthcoming in this case? This most recent post over at STW is a bit erratic. As Brandon S. noted on Twitter, it’s ludicrous for Dr. Lew to suggest that John Cook couldn’t possibly be expected to moderate the comments of the secret SKS forum. And as the Leopard in the Basement points out in the comments at STW, a link to raw data that Dr. Lew included actually linked to a copy of Recursive Fury not the Supplementary Material that was posted last year. The moderator, Dr. Lew I presume, has promised to correct that error. But this communications deleting thing is what jumped out for me. Frontiers In, as far as I know, has no obligation to retain communications unless they are subject to some pending legal demand. If the journal was a party to ongoing litigation concerning Recursive Fury then deleting communications would be very concerning. In this instance nobody has filed suit and I suppose they could delete all communications regarding the matter. That said, given that lawyers were engaged to negotiate a contract and retraction language I would be surprised if they didn’t retain their copies of the paper trail. And it seems unlikely that they would request other parties to delete communicatinos. Any communications on behalf of UWA including email that passed through the university servers would be subject to UWA’s retention policies (whatever they are) and FOI. In one of the posts at Climate Audit regarding this whole fiasco I recall that someone, Steve perhaps, made mention of an Australian who has been filing FOI requests for documents relevant to Recursive Fury. Given the attention that has been given to this paper there are probably several requests out there. If that’s the case I would be surprised if UWA would be allowed to delete the communications before all the requests were satisfied in one manner or another. Of course any communications between and/or including lawyers for UWA, the authors and the Journal might be privileged and protected. But I doubt that allows the University the opportunity to immediately destroy those communications I’m not familiar with Australian FOI rules but I assume that conversations with lawyers have some protections. If that’s the case then FOI responses would simply cite that protection and state that certain documents were not produced. One thing is certain, I’m running out of popcorn. I’ve got a longer comment stuck in moderation. It’s surprising Dr. Lew would use the term “destroy” and acknowledge that he had complied with the Journals’s request. I dont know that the journal did anything wrong if they made that request and if they actually destroyed anything. But the university surely had an obligation to protect anything that was subject to a pending document request. Even if they might claim some sort of exception because lawyers were involved I would expect that they should retain the communications. This mess gets messier and messier. I suspect that if lawyers were indeed involved, copies of everything at issue are still available. Indeed! With each passing day it seems that (in the fashion of a *true* “revisionist scholar”), Lew is perfecting his skills at muddying waters under very shaky bridges by unleashing the furies of his recursive messiness! Re: DGH (Apr 9 08:22), The problem is that until you understand what Lewandowsky has to say it’s impossible to understand what he has to say. This leads to a building of emotion which almost inescapably leads to Explosive Fury Reloaded. Until he ceases to play fast and Lews with the truth, this pattern will continue. Of course he could be doing yet another experiment in which he gauges peoples reaction to his supposed destruction of documents. More likely, an editor said something to the effect of, I’d like this all to be a distant memory, and wink wink, nod nod, Lew “knew” what they really meant. In what capacity was the correspondence with frontiers destroyed, in the wake of Enron a number of legislative safe guards were put in place regarding the destruction of data. If the correspondence was with Lewandowsky at the University or in relation to public work carried out while at the University then destruction of the data may be a criminal act. Selective and convenient amnesia? The “I have no recollection of that, Sir” defence? PS and why speak in the third person? This is not third person. It is merely plural first person. That means there is more than one of them. Surely the letter of 11th Sept 2013 is a blatant attempt to circumvent the University’s ethics policy. Isn’t there a case to have the authors qualifications revoked? or is that pushing it a bit too far? From what I understand through reading this post is that; he has clearly hoodwinked the ethics board in an attempt to get his paper through that stage of the process for what is in my opinion, personal gratification and ulterior motives to what the original – claimed purpose of what the survey was. Obviously Steve McIntyre did not hack the forum but that appears to be what Dr. Lew is alleging. Recursive maliciousness and defamation? Blogged at Lucia’s that breach of privacy rules in Australia is a much bigger bar to beat the UWA with. FOI concerns can be ignored but mention a breach of privacy and everyone gets upset because we can all so easily be charged with it. Even the merest mention of “has privacy been breached in this case” will result in the heebie jeebies and much more attention being given to your polite requests for attention. Please try Privacy act tactic to get more immediate results. New variations to act recently promulgated. Bingo , instant reaction at speed of light with much more respect and attention paid to your other legitimate requests. I think that UWAs lax handling of Lew’s ethics clearance is NOT likely to be an isolated incident. Is there any Australian citizen rights (or other) organisation who would be interested to quantify and FOI (say) the last five years worth of UWA ethical research clearances to see if the public are being properly protected? The change of use of the ethics application reminds me of the final season of The Wire. The protagonist invents a serial killer, so as to allow for a wiretap, which is then redirected to be used against the drug dealer they are targeting. Resources provided to catch this serial killer are then used by the drug task force. In the end they lost much of the case because of the illegal means of pursuit. I’ve been looking the UWA ethics policy and the Aussie national policy, which (curiously) mainly defers to a US Department of HHS policy document. The UWA document is pretty thin, but it does refer to a “How to write a good ethics application” which may or may not consist of formal requirements. That document does clearly mandate that authors NOT disclose individual identities of research subjects without their prior consent. It says researchers must disclose conflicts of interest. Does the mere existence of “WatchingTheDeniers” web site or SkS indicate or hint at a prior hostility to the subject matter? Of course. But anyone can go cull through these sites and see tons of specific hostility towards the “subjects” uttered by the authors. ‘ethical conduct’ is more than simply doing the right thing. It involves acting in the right spirit, out of an abiding respect and concern for one’s fellow creatures. This National Statement on ‘ethical conduct in human research’ is therefore oriented to something more fundamental than ethical ‘do’s’ and ‘don’ts’ – namely, an ethos that should permeate the way those engaged in human research approach all that they do in their research. If anyone thinks that Lewandowsky, Cook and Marriott treated their research subjects in this spirit, well, let’s just say that you could use the services of a good psychologist. But, on the upside, Lewandowsky continues to be climate-alarmism’s tar-baby. Everyone who supports his sloppy and hostile tendentiousness is going to get some on of it him. The fury cuts both ways. Hard to know how it will end. We’re not only deniers now, we are “delusional” deniers. Note to Bjorn: it’s properly called “skepticism.” Try it some time. I’ll be very concerned if 97% of the editors resign. A quick Googling of Brembs shows little in the climate arena, nothing in psychology, no more leftist thought than many of the commenters here. His departure seems a little knee-jerk and perhaps uninformed. If nothing else there are few jobs that are waiting to be filled. Can anyone identify the person who provided the following example of conspiracist ideation? First, I identified the drivers of newspaper coverage of climate change in Australia and the news sources who accessed the news media to discredit authoritative scientific knowledge about climate change. I found that these news sources have historical, material connections to American think tanks, Australian conservative political parties and economic interests in the fossil fuel, mining and energy industries – all of which oppose policies to reduce greenhouse gas emissions. I then mapped out the discursive strategies used by these news sources and the ideological basis of the narratives propagated through discourse coalitions that permeate the Field of Power which encompasses the political, economic, academic, media and think tanks social fields. Finally, I designed synchronic case studies to examine the representation of scientific knowledge about climate change in newspapers across Australia. My case studies confirmed that ideological and partisan orientation are the main factors that determine a newspaper’s or journalist’s attitude towards the science of climate change. In my future research, I plan to build on my PhD study to further investigate how economic interests use think tanks, the news media, social media and social movements to engage in the social production of scientific ignorance in order to manipulate policy debates in the areas of environment, energy and public health. Yes, but I made the mistake of reading some of her earlier work, and I think Willis quoted it at WUWT. Yes, HAS, the fact that the person who wrote that screed was a reviewer of Recursive Fury exposes the paper for what it was: a farce. Unfortunately, it was a bitter farce that had intended victims. It seems like Lewandowsky couldn’t find a reviewer in his own field who would want to be associated with the paper, so he got one of his friends to help. She earned an undergraduate degree at UWA in geography around the time (1993) that Lew started working there and proceeded to spend several years (1995-2003) writing about the geography of prostitution. Shortly thereafter she discovered the “media war on science” after reading Ian Plimer’s book on climate change and is now trying to get a doctorate in what appears to be an entirely new field–politicized journalism. Indeed, not new at all. They used to just do it. Now they are offering post-graduate programs in how to do it. I also recognized McKewon’s writing right away. I just posted the following at Björn’s blog. We’ll see if it makes it past moderation. It’s sad how badly uninformed Björn is, in making this decision. He is incensed about “deniers.” What he doesn’t understand is that most if not all of the “deniers” named in the study are not the kind of “deniers” he imagines. They generally all agree that: CO2 causes some amount of warming, man has increased the level of CO2 in the atmosphere, the thermometer record shows the earth has warmed particularly in recent centuries, and that at least some of this warming is very likely a consequence of the CO2. The real climate argument does not lie in any of these questions. Please get a clue, sir. You rant about what you do not know. And that’s the problem with too much of what goes for climate journalism and debate these days. Objectifying those who have valid critiques of badly-done science is not going to help improve the science. It’s actually those who lambaste the questioners who are setting science back. For the paper in question, the issue was clear, the analysis was exhaustive, all efforts were made to work with the authors to find a solution and we even worked on the retraction statement with the authors. But there was no moral dilemma from the start – we do not support scientific publications where human subjects can be identified without their consent. The mistake was detected after publication, and the authors and Frontiers worked hard together for several months to try to find a solution. How well did they fulfil their core mission? Not well, seems to be the answer. The reviewers were a journalism student and an editor of the magazine. The paper identified individuals. The analysis itself was dreadful. …because climate change is a very serious threat for human civilization. But the importance of the subject matter does not justify abandoning our principles. Line drawn. Thank you Frontiers.
. . . we do not support scientific publications where human subjects can be identified without their consent. It would be interesting to look back at their archives and see if this actually was the policy. When they say they noticed it “after publication” they are simply saying it was brought to their attention by the victims of the study. Why they couldn’t see it themselves in editing the paper is something that will no doubt go unexplained. Again, I wonder if other researchers have gotten away with Lew’s techniques in the past. It makes me wonder how many papers find their way into print without ever having been read by anyone except maybe the person (or computer program) who wrote it. Maybe not even the co-authors. Do papers get into print without having been read by more than one of their listed authors? Yes, all the time. Do papers get into print without having been read by any of the reviewers who agreed to review them, or by the editor who approved their publication? It’s never supposed to happen…but chances are it sometimes does. The least credible part of the newest Frontiers statement is “The mistake was detected after publication…” There’s no way the naming of subjects without their consent could have been missed, but there’s an excellent chance none of reviewers, or the action editor, cared about the naming of subjects without their consent. Whether articles like “Fury” have been published before would take a fairly extensive research effort to find out. It’s possible Lewandowsky is a true innovator where pushing the envelope is concerned: both in turning a reply to critics into a purported scientific study of their pseudo-psychopathologies, and in joining with two of his coauthors in publicly ripping these same critics during the period of “observational” data gathering with “no approach of” the subjects. Was “the incident” around climate change ? It would seem that “the incident” was around professional ethics. Dr. Peter Venkman: Alice, I’m going to ask you a couple of standard questions, okay? Have you or any of your family been diagnosed schizophrenic? Mentally incompetent? Librarian Alice: My uncle thought he was Saint Jerome. Dr. Peter Venkman: I’d call that a big yes. Uh, are you habitually using drugs? Stimulants? Alcohol? Dr. Peter Venkman: No, no. Just asking. Are you, Alice, menstruating right now? Library Administrator: What has that got to do with it? Dr. Peter Venkman: Back off, man. I’m a scientist. off topic for this thread but I just glanced at Dr Joelle Gergis personal webpage and she still proudly lists the retracted Australasian article as one of her accomplishments.(#44). It looks like Lewandowsky just can’t leave the issue alone. Is he warming up to sue Frontiers? The only justification for this would be that Lewandovsky was worried that informed sceptics might “conspire” to appear less concerned about conspiracies. Is that not in and of itself conspiracy ideation? Thought you might be interested in Lewandowsky doing an AMA on reddit. Quite nauseating. This Reddit forum is highly moderated for non-scientific comments, and yet dozens of comments about how “climate deniers” are “paranoid” etc., based on no source except the author’s opinions, are up on the thread, while others have been deleted. I would bet $10 that the deleted comments referenced the ethical issues outlined in this post. Confirmed: I posted a comment linking to this thread, and it was swiftly deleted. A comment pointing out that the raw data for Lewandowsky et al.’s “Moon” paper are being withheld was quickly deleted. There is currently a really good discussjon on Bishop Hill about the latest comment from Frontiers about the excised Lewandowsky paper. Psychology has been used for political purposes in despotic states such as the former Soviet Union, where dissidents were declared insane and institutionalized. But it can be abused in less extreme ways. One could imagine, for example, a public figure being undermined because of a psychology paper that psychoanalyzed him or her in an unflattering way. Such a paper could be extremely damaging as it would have the full weight of “medical science” behind it. The Fury paper approaches this kind of abuse. Those researchers seem to be about as clueless as Lewandowsky, but they got a PNAS paper and a high media profile for their efforts.